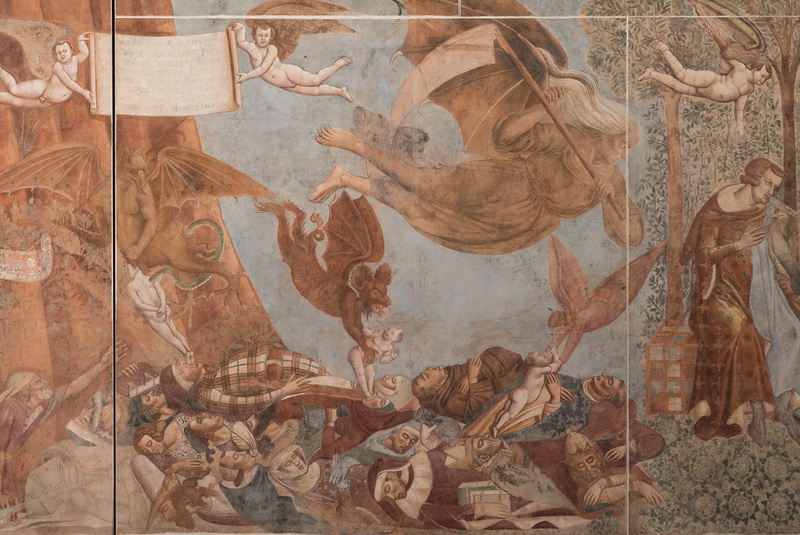 With the scene of the Triumph of Death the ambitious project of restoration of the pictorial cycle that decorated the walls of the Camposanto ends. The restoration works of the scene of the Triumph of Death by Buonamico Buffalmacco is going to be completed and the ambitious restoration project of the great pictorial cycle that decorated the walls of the Camposanto Monumentale di Pisa is almost concluded. A long history, made of innovations and moments of criticality, which saw the participation of art historians, scientists, technicians and especially restorers. The works were carried out by the restrers of the Opera della Primaziale Pisana and, starting in 2009, under the supervision of the Works Directorate chaired by Professor Antonio Paolucci and supervised by the restorers Carlo Giantomassi and Gianluigi Colalucci. The Triumph of Death will be relocated by mid-June 2018 to its place of origin. 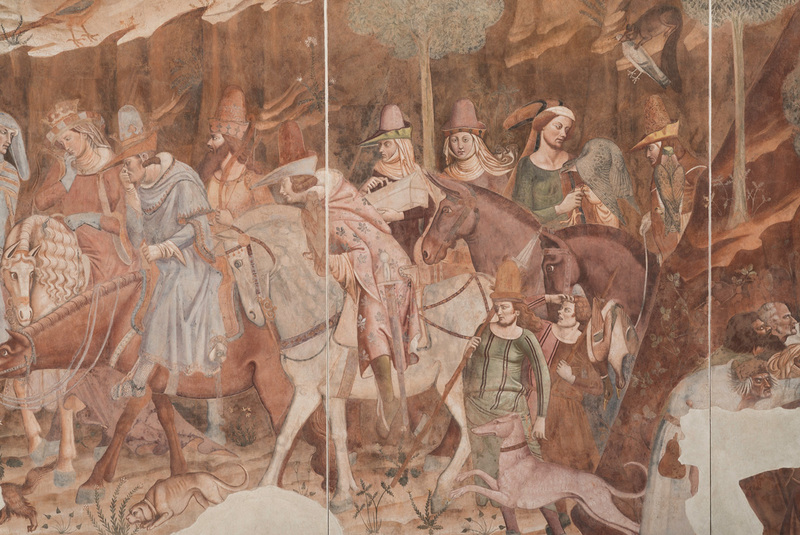 The cycle of frescoes of the Camposanto Monumentale is an immense painted program, made by the greatest masters of the Three and Fourteenth century and consisting of almost two thousand square meters of painting. Already during the fifteenth century there is evidence of interventions to repair damage of various kinds. The restorations continued and got more frequent in the eighteenth century as evidence of a deterioration that probably would have erased all traces of painted surfaces. The tragic events of the end of the Second World War substantially accelerated this deterioration, after which it was decided to proceed with the separation of the entire cycle from the walls of the gallery. 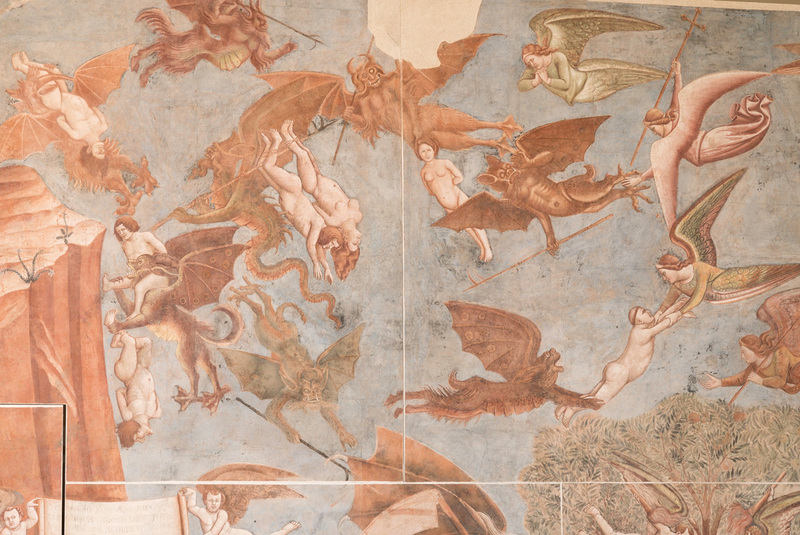 From time to time, the frescoes have undergone numerous interventions and only the last restoration, conducted with extreme skill by the restorers of the Opera della Primaziale Pisana, has allowed a full recovery of the artworks. The current Works Management entered the scene in 2009. The new managers have since continued the restoration and relocation of many already detached frescoes on the wall, but above all they have made a fundamental contribution to the restoration of the three great scenes of the best known cycle, painted by Buffalmacco. Its state of conservation required, in fact, a rethinking of the various phases of intervention. It was decided to change the technique of detachment from asbestos until then adopted, which included many steps and operational phases that risked distressing excessively the pictorial film. The support has also been modified and fiberglass and aluminum supports (aerolam) have been adopted. For the cleaning, the work of the eating bacteria continued: an innovative system developed by the microbiologist Giancarlo Ranalli of the University of Molise. These bacteria applied to the surface of the painting for about three hours, totally eliminate the organic material, without damaging the original color. Moreover, a fundamental problem related to the relocation of the frescoes in the Camposanto has been solved, namely the problem of condensation. A team composed by the engineer Roberto Innocenti, Dr. Paolo Mandrioli of the C.N.R. 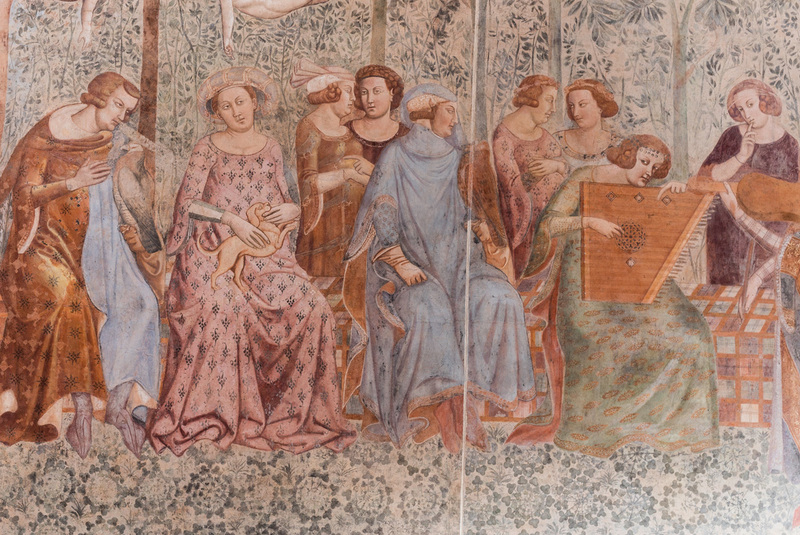 and the engineer Giuseppe Bentivoglio of the Opera della Primaziale Pisana, has designed and tested a system of retro heating of the surface of the fresco. The system, which at the occurrence of conditions favorable to the formation of dew, raises the surface temperature of 2/3 degrees centigrade above the temperature of the environment, thus avoiding the harmful condensation. Completely original, it is managed by sensors that detect every 10 minutes ambient humidity and surface temperature from the frescoes and, in critical conditions, automatically controls the activation of the back heating system. The cycle of the Triumph of Death was one of the first to be made between 1336 and 1341. 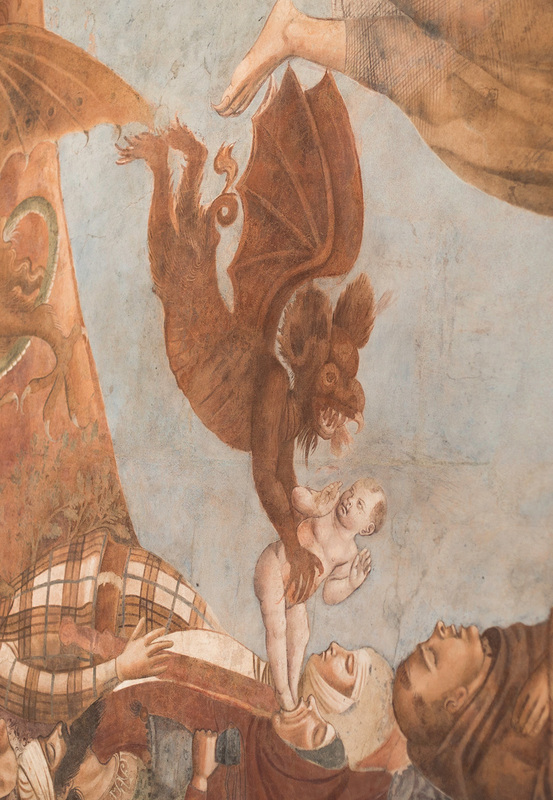 Painted by Buonamico Buffalmacco, protagonist of many novels by Boccaccio, it consists of three different scenes: the Stories of the Holy Fathers, the Last Judgment and Hell and the Triumph of Death. It is in this last scene that the painter reaches its maximum expression, combining different autonomous narrative nuclei, functional to the representation of the theme. The first sees, on the extreme left, three corpses suddenly discovered by a brigade of elegantly dressed young men, engaged in a hunt. In the center of the scene, a group of cripples and beggars in the act of invoking the rapid end that has already reached lay and ecclesiastics by their side, while on the right side, we can see a conversation of courtesans gathered in a lush garden. Death hangs over all of them, accompanied by a host of winged demons struggling in heaven against the angels to conquer the souls of the dead. Even the scene of the Last Judgment is set on two levels: Christ and the Madonna at the top, flanked by angels and the celestial sphere, while in the lower order the dead are divided among the elect, held to the right of Christ, and the damned dragged into the rounds Hell. The narration continues with the next scene, the Stories of the Holy Fathers, or the Anchorites, tempted in the Egyptian desert by the demon that appears in a thousand disguises. The whole cycle of Buffalmacco was influenced by the works of the fourteenth century’s Dominican Domenico Cavalca, a severe whipper of all worldly vanities, and shows surprising affinities with the contemporary creations of Dante and Boccaccio. The vivacious narrative and the vivid colors, which characterized all the walls of the corridors, captured the attention of the spectator, guiding him in a continuous reflection on the theme of suffering. A spiritual journey that takes place in a closed space, confined behind the severe curtain of white marble that overlooks the Piazza del Duomo.